Newly completed genome sequences are emerging at ever-faster rates, and microarrays ('DNA chips') are now routine tools for exploring genome-wide changes in mRNA levels (see the 'Background' box). Most journals are bursting at the seams with genome maps and brightly colored gene-expression profiling data. But few studies have sought to explore the relationship between the organization of the genome and the transcriptome. 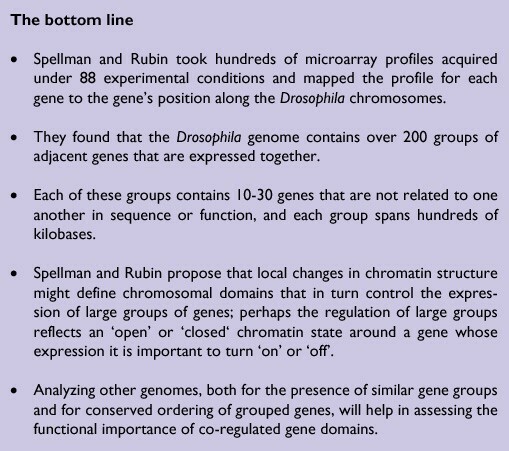 In the maiden publication of the Journal of Biology, Paul Spellman and Gerald Rubin, of the Howard Hughes Medical Institute and the University of California, Berkeley, describe how they analyzed microarray data from 88 different experimental conditions according to the chromosomal location of each gene within the Drosophila genome  (see 'The bottom line' box for a summary of their work). They come up with the remarkable observation that the genome contains many large groups of adjacent genes that are expressed similarly but are not functionally related to one another. These results challenge the way we think about the mechanisms of gene regulation and the influence of local 'territories' within chromosomes. Spellman and Rubin form an ideal partnership for this 'flies and chips' project. Rubin is one of the leading scientists in the Drosophila field. Using carefully crafted genetic screens, his laboratory has helped to make the fruit fly Drosophila melanogaster the star model of developmental genetics. Rubin also leads the Berkeley Drosophila Genome Project, a unique collaboration between academic laboratories and the industrial sequencing giant Celera Genomics that generated the first whole-genome shotgun sequence of a eukaryote genome in record time [2,3]. Spellman is a graduate of Patrick Brown's laboratory at Stanford University, where he mastered chip technology and helped develop computational algorithms for analyzing microarray results. Pioneering work from the Brown and Botstein laboratories exploited their home-made chips to demonstrate the power of microarray technology, analyzing genome-wide changes in gene-expression levels in the yeast Saccharomyces cerevisiae under different experimental conditions . Spellman is now a postdoctoral researcher in Rubin's laboratory where he is chipping away at the fly transcriptome. The Rubin laboratory has been using a DNA chip called the GeneChip Drosophila Genome Array, containing nearly 200,000 spots that represent the approximately 13,500 predicted fly genes; the chip was created by Affymetrix Inc., a leading manufacturer of high-density oligonucleotide microarrays. Spellman and Rubin pooled microarray data from 88 different experiments (mostly unpublished) using Drosophila, corresponding to 267 separate hybridizations. Many of those who have plunged into the world of transcriptome analysis have found that the biggest challenge lies in picking out the jewels from the mountain of hybridization results. 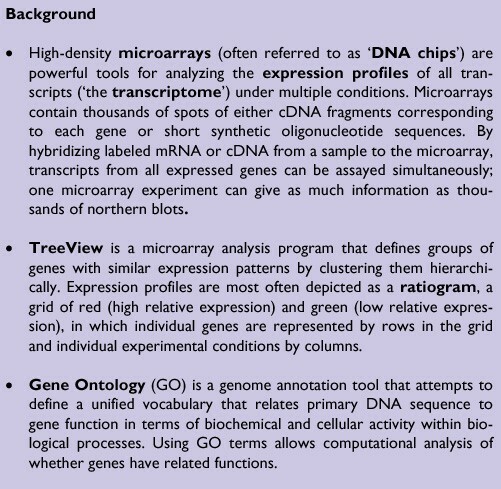 The authors of early microarray papers contented themselves with providing a list of genes whose expression increased ('turned on') or decreased ('turned off) under certain conditions. The underlying assumption was that changes in the expression of an individual gene are of biological relevance. In 1998 Spellman co-authored a paper with Michael Eisen, then in David Botstein's laboratory at Stanford, describing a method for analyzing microarray data by 'hierarchically clustering' genes with similar expression profiles . Today, authors of most microarray papers apply bioinformatics tools such as the 'Eisen clustering algorithms' and associated TreeView software to make sense of their data. These turn hybridization data into 'ratiograms', a mass of green and red bars (see Figure 1) that are easier on the eye than a mass of raw data presented numerically (although color-blind researchers are at a distinct disadvantage). An example of a group of adjacent genes that are similarly expressed (adapted from ). For each square on the grid, red denotes relative expression higher than the average for a gene in an experiment, green denotes lower relative expression and black indicates that the expression is equal to the average. There are over 200 such groups within the Drosophila genome. The assumption has been that groups of co-regulated genes have potential biological significance; they may represent subsets of genes required for a particular transcriptional program or physiological process. This idea has been reinforced by the observation that expression profiling can identify groups of genes that effectively distinguish between different forms of cancer or even predict clinical outcomes . Now, in their Journal of Biology paper, Spellman and Rubin have taken a different approach, investigating genes according to their position on the chromosome and relating this to similarities in their expression patterns. When they analyzed data from 267 hybridizations from adult flies and embryos, they found that groups of physically adjacent genes had strikingly similar expression profiles; one fifth of all genes lie within about 200 such groups, spread throughout the Drosophila genome. "I was stunned when I saw the first results" recalls Spellman. "We really hadn't predicted this." (See the 'Behind the scenes' box for more of the background to the work.) The groups have an average size of 12-15 genes, with individual groups spanning up to 450 kilobases. Spellman carried out a series of rigorous checks to ensure that the results were real. The gene groups are not related to the banding patterns of Drosophila polytene chromosomes nor to known chromosomal structures such as scaffold-attachment sites. Computational analysis of the groups also demonstrated that they could not be explained by any detectable similarity between the genes within similarly expressed groups - not gene homology, gene ontology, or related function. The idea of co-regulation of adjacent clusters of genes has been around for a while. More than 50 years ago François Jacob and Jacques Monod discovered operons - groups of genes that are expressed from a single promoter in the form of a polycistronic mRNA. Operons are common in bacteria and archaea and usually encode proteins that function together. But there are few examples of polycistronic mRNA in eukaryotes. Some examples of co-regulated clusters have been extensively characterized in mammals, but these predominantly contain related genes and have been considered to be rare cases, for example the developmentally regulated Hox genes and β-globin locus, or genes within the major histocompatibility complex. Some studies have hinted that eukaryotic genes may be organized in distinct domains that are coordinately expressed. "These provocative results [from Spellman and Rubin] are reminiscent of what's been seen in yeast," says George Church (Harvard Medical School, Boston) referring to a study from his lab which showed that pairs or triplets of yeast genes that are highly expressed are often adjacent on the chromosome . Spellman speculates that similar domains probably exist in most animal genomes. Indeed, a study from Rogier Versteeg's group (University of Amsterdam) used data from SAGE (serial analysis of gene expression) experiments in a range of human tissues and cancer cells to show that highly expressed genes were often grouped together in chromosomal domains . "These are probably just the extremes of a continuum," says Versteeg; "the whole genome might be divided into domains of weak, high or intermediate gene expression." Very recent work from Laurence Hurst's lab (Bath University, UK) has also shown that genes that are expressed in most tissues (which they call 'housekeeping' genes) are found in groups within the human genome . Unlike SAGE data, microarray results are usually expressed as expression ratios rather than as absolute expression levels. Spellman has tried turning the fly chip data into expression intensities and found that highly expressed genes were also in groups. Interestingly, Spellman notes that "there is only a partial correlation between domains defined by expression profile and those of high expression intensity." The intriguing observations by Spellman and Rubin pose a number of challenges about how chromosomal domains are created and maintained, why the genome contains such large clusters of similarly regulated genes, and the nature of transcriptional control. "It raises a lot of questions," says microarray aficionado Brian Oliver (NIH, Bethesda), referring to the Spellman and Rubin paper as a "call to exploration" and predicting a flood of papers exploring these domains. "Is control at the level of individual genes or whole domains?" asks Versteeg. "That's the most important question, but it's too early to say and it might take a long time to answer." Mapping the transcriptome back onto the genome may help to link what is known about the fine-detail and large-scale regulation of transcription. In the good old days (before genome sequences and chips) the detection of quantitative changes in the expression of an individual gene (usually by northern blot analysis) was followed by a systematic and laborious characterization of its promoter and nearby enhancer sequences that act as a switch to determine whether a gene is on or off. This led to exquisite models of transcriptional regulation controlled by a precise network of sequence motifs and cis-regulatory modules. More recently, enhancers have been found capable of regulating genes from quite substantial distances. Additional complexity has been revealed by studies of chromatin structure: different conformations of chromatin can regulate transcription and the accessibility to transcription factors by creating physical domains that are effectively 'open' or 'closed' for protein-DNA interactions. Spellman and Rubin found that there is often a predominant gene within each chromosomal territory that is most strongly expressed or repressed and they suggest that the behavior of neighboring genes might reflect a general 'sloppiness' in transcriptional control. "We don't have a mechanism," admits Spellman, "but I think the most likely explanation is regulation at the level of chromatin." Open chromatin conformations may be created to drive the expression of a certain key gene in the domain with the rest of the nearby genes "in effect being carried along for a ride" . As long as their expression is not harmful to the cell, the changes in transcription of most genes may not be too important. "The regulation of transcription may be precise when it is needed and sloppy when it is not important," write Spellman and Rubin . Versteeg strongly rejects the notion of sloppiness in gene control, however, citing the catastrophic consequences of trisomy in humans. Biologists will be keen to understand how the territories are established. "My gut feeling is that it's driven by boundary elements" says Spellman. Church agrees that defining the nature of the domain boundaries is an important challenge. "If we have enough examples it might be possible to search using motif alignment tools," he says, but he predicts that this will be harder than it was for promoter motifs. It might be some time before the mechanisms involved and the biological consequences are clearly understood. "It's possible that the expression domains are regulated by the three-dimensional structure of the nucleus and the 'nuclear address' of specific chromosome regions," speculates Oliver. Versteeg proposes that "genes that are highly expressed might be clustered together to facilitate post-transcriptional functions such as splicing and RNA processing," citing the existence of nuclear speckles - sites of splicing and RNA metabolism. Experiments with directed transgene insertions may help to address some of these issues. Comparison with similar studies in other organisms, and correlations with regions of conserved synteny within the genome, are likely to provide insights. And evolution may give us hints about what's going on and about biological relevance. The paper from Spellman and Rubin  represents a delicious taste of what's to come in the post-genomic era, as extensive genome and transcriptome datasets become available. One result of the work is that microarray analysts might henceforth choose to map their gene-expression profiles to the relevant genomic location, before they construct elaborate theories about specific transcriptional programs on the basis of which genes are turned on and off. We clearly have a lot to learn about chromosomal territories and boundaries within the fly genome and perhaps in the genomes of the worm, the weed, mouse and man.